This page lists the events we have done since the website was set up in 2015 (see our newsletters for earlier events). We had two visits to the carillon – Sundays 17 and 24 March at 1:30pm (prior to a Carillon recital at 2:30). The visits were strictly limited to 9 people per visit due to the narrow spaces and were fully booked. National Carillonist Timothy Hurd gave us a talk and then led us up the carillon to see the six largest bells and the room with the keyboard and a practice keyboard (plus stunning views of Wellington). The carillon is part of the National War Memorial (a Category 1 complex). “The National War Memorial of New Zealand, consisting of a Carillon constructed in 1932, and a Hall of Memories completed 32 years later, is a solemn tribute to, and a commemoration of, the contribution of all those New Zealanders who have served and died in war.” (Heritage NZ List entry). Recently, the carillon tower and Hall of Memories were earthquake strengthened and cleaned as part of the construction of Pukeahu National War Memorial Park. A carillon is a musical instrument – the largest musical instruments in the world. They consist of at least 23 bells, typically housed in a campanile (bell tower), which are tuned so they produce a melody when played. The NZ carillon is the third largest in the world, both by number of bells (74) and their combined weight. You can read more on the Ministry for Culture and Heritage website. Photos from the first visit: National Carillonist Timothy Hurd demonstrated playing the Carillon. Also showing some of the six largest bells and the view from the Carillon. Wednesday January 30th and Thursday February 21st 2019 : “Secret Art Walk” – about 15 members enjoyed exploring some of the art in foyers of central Wellington commercial buildings with Vivienne Morrell on a two-hour walking tour. There was also a heritage focus – beginning at the site of the former Wellington Hotel of Baron von Alzdorf who was killed in the 1855 earthquake (now the location of Bowen House, Lambton Quay). Saturday 17 November 2018, 2pm – about 22 members and friends visited four historic buildings in the Wellington CBD beginning at the Christian Science Building, 285 Willis Street. #The Manor received funding in the recent round of Heritage Equip for seismic strengthening. The Manor is a Category 1 historic place designed by William Turnbull and completed in 1908 as a residence and surgery for surgeon Sir Donald McGavin. This talk was given at the VUW School of Architecture, 139 Vivian St, Lecture Theatre 2. Terawhiti is the mostly rural area to the west of Wellington that most Wellingtonians would only know by flying over it or seeing it from the Cook Strait ferry. Vivienne researched the history of this area for Heritage New Zealand (formerly Historic Places Trust) and wrote the report for the historic listing of the Albion Goldmining Company remains. At various times from the 1850s to the 1910s the area was a site for gold prospecting – it is the lower North Island’s only example of a large area that includes a range of gold-related sites. Vivienne gave a presentation on the history of the area and, in particular, the goldmining. Vivienne is on the committee of Historic Places Wellington and once a year teaches an evening class at Wellington High School called ‘City Stories: Wellington’s Architectural Heritage’. Despite its enormous impact on New Zealand society, the centenary of the epidemic has not generated a lot of publicity. Barbara and a band of volunteers have identified the graves at Karori Cemetery of those who died from the influenza epidemic, have been cleaning them, researching some of the families and plan two open days of commemoration in November. The website is: https://1918influenzakarori.weebly.com/ and the commemoration programme is here. Sunday 27 May 2018. Some members attended a screening of the very interesting film called ‘Test of Faith’ about St Mary of the Angel’s earthquake strengthening and refurbishment at the Embassy theatre as part of the Resene Architecture and Design Film Festival. (Photos by Nigel Isaacs.) A dozen or so members joined the newly incorporated Heritage Wairarapa, which held a public meeting at the old Carterton Court House, Holloway Street Carterton on Sunday 15 April 2018 at 2.00pm, with visits before to Wakelin’s Mill and Carterton Library. Our first event for 2018 was a guided walk around the Wellington CBD with archaeologist Mary O’Keeffe. Mary did this walk during Heritage Week last October and it was booked out, so she offered it twice for HPW members. The walks were on: Saturday 17 February at 6pm and Saturday 10 March at 10am. Mary is a consultant archaeologist, who has been poking around bits of Wellington for the last 20 years. This guided walk looked at the archaeology of some of the projects she’s worked on, and what these sites and places can tell us about life as a Wellingtonian. In the old BNZ building showing remains of Plimmer’s Ark, that Mary helped salvage. On Weds 15 November 2017 Dr Ben Schrader, historian, spoke to about 45 members and invited guests from the Thorndon Society on the topic: Residential E and the Saving of Thorndon. Photo by Nigel Isaacs. HPW chair Priscilla Williams introduces Ben. Ben is currently working on a book with Michael Kelly on the history of historic preservation in New Zealand and Thorndon will be a case study. Thorndon is New Zealand’s oldest suburb. By the 1950s much of the old housing in Thorndon was run down and talk of ‘urban renewal’ and the extension of urban motorways was common here and in many places overseas. 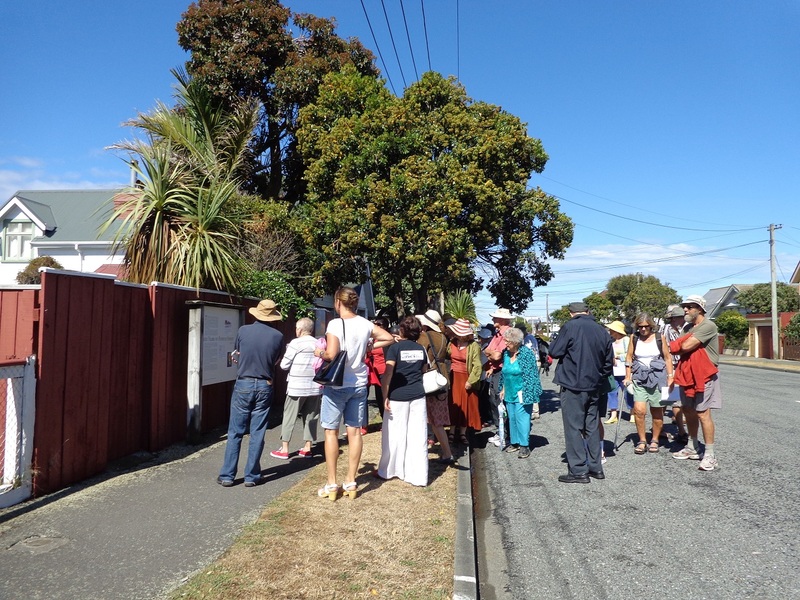 Ben outlined the destruction the Wellington urban motorway caused through Thorndon and the response of residents and city council in setting up the Residential E district protection. In keeping with the topic, the talk was held in the historic Thorndon School Hall. Historic Places Wellington was lead organiser of the successful Wellington City Heritage Week (23 – 29 October 2017), which included talks, walks, and visits to historic buildings. Here is a selection of photos from some of the events. Historic Places Wellington AGM, Thurs 10 August, 2017 5:30pm: Twenty-nine members came to the AGM. Unfortunately technology difficulties meant we did not hear from our scheduled speaker, historian Ben Schrader, author of The Big Smoke, an urban history of New Zealand 1840-1920, speaking on Thorndon (the talk was rescheduled to November). The Wellington Opera House at 109-­117 Manners Street (Category 1, List No. 1432) has a colourful history. Designed by an Australian architect, William Pitt, the building’s construction was overseen by his brother-­in-­law, Albert Liddy. The building featured natural ventilation as well as an innovative sliding roof and sliding ceiling system above the main seating area. Within 15 years of construction this system was no longer in use and the sliding roof was rumoured to have only ever opened once, although the mechanics remain. Structural renovations, including seismic strengthening in 1977-­1982, have blocked most of the original natural ventilation inlets but no new system has been added. Architecture Victoria University of Wellington. Her research is investigating the history of natural ventilation design in auditoria, and the feasibility of reintroducing such systems in the present day. On a cold but clear Sunday, 21 May 2017, members took a bus trip to see some of the Hutt Valley’s earlier historic buildings. We first visited Category 1 historic place Christ Church, Taita where Janice told us some of the history and stories from this very early church (1853/4). Christ Church is the oldest church still standing in Wellington; its first service was held on 1 January 1854. We also discovered that well known Wellington church architect Frederick de Jersey Clere was buried in the graveyard. Our next visit was to The Blockhouse, Trentham (another Category 1 building). Bruce spoke to us here. The Blockhouse was a defensive structure built in 1860, but never used in warfare. It is a very rare surviving example of this type of defensive building in New Zealand and is also historically significant as the legal protection given in 1916 is one of the first recorded examples of statutory protection of a historic building in New Zealand. Its most unusual feature was that the wall cavity between the exterior and interior was filled with fine gravel to absorb the impact of gunfire. We were fortunate to be able to see a well presented exhibition on The Blockhouse at Expressions Gallery in Upper Hutt. We next visited Golder’s House. The house was built in 1876-1877 by John Golder and is a Category 2 listed building. Golder’s House and outbuildings provide valuable insight into colonial domestic life. The various outbuildings, such as the laundry, a water pump, and food store (also registered as a Historic Place, Category 2) were fascinating and prompted many to comment on things they recognised or didn’t know what their purpose was. Our last visit was to St John’s Anglican Church (a Category 2 historic place dating from 1863). Frederick Thatcher (1814-1890), at the time vicar of St Paul’s parish, and architect of (now Old) St Paul’s Cathedral, probably designed St John’s. Many of the stained glass windows were designed by Beverley Shore Bennett, a leading New Zealand stained glass artist. Over 40 people went on a bus tour of the Paraparaumu and Waikanae areas on 26 March 2017. 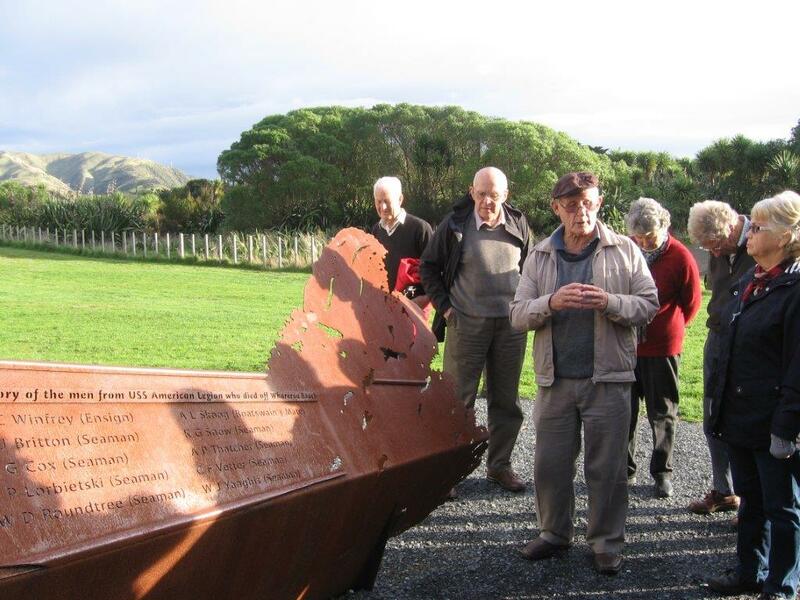 Led by local historian Anthony Dreaver and archaeologist Mary O’Keefe, the tour covered early settlement sites, urupa, viewing points and finished at the Waikanae museum. Anthony prepared a very interesting booklet for participants on the ‘four Waikanaes’ – the different settlement phases and locations of Waikanae. After viewing Kapiti Island and hearing some of its history, we next went to the site of the main Te Ati Awa village from 1824 to the 1840s, Kenakena (or Waikanae) pa and site of the first church built in 1843. Kapiti District Council’s Arts, Museums and Heritage Advisor, Jaenine Parkinson with Anthony Dreaver looking at the site of the first church, built in 1843. The next stop was to view the Waikanae estuary, old Ferry Inn and Arapawaiti cemetery reserve, where the family of the first ferryman are buried. Mary O’Keefe who was the archaeologist for the expressway project also gave interesting information about some of the things she found – and didn’t find – during the building of the new expressway. From Takamore urupa we viewed the site of the second ‘Waikanae’, Tuku Rakau. There was no organised Pakeha settlement until the railway went through in 1886. The trip finished at the former Post Office – now the Kapiti Coast Museum. On 16 August 2016 we held our AGM. After, Wellington City Councillor Andy Foster gave us an informative talk on some of Wellington’s heritage buildings’ earthquake prone status, and work on remedying that, as well as issues facing resolving the earthquake prone status of Wellington Town Hall. On Saturday 25 June 2016, 25 members visited two historic Thorndon houses: ‘The Crescent’ in Goldies Brae, and the Italian Ambassador’s house in Grant Road. It was probably only the second house in Wellington to be built in concrete – the first being the house Government Architect William Clayton built for himself in Hobson Street (since demolished). It is likely the architect Charles Tringham had some involvement as he placed an advertisement for tenders for various works in Nov 1875 and for “painting and glazing required at Dr Johnston’s new residence” – specifications at Charles Tringham’s office (Evening Post, 3 Jan 1876, p. 3). HPW members with the ambassador’s spouse, Javier Barca. The Italian Ambassador’s House, built in 1877, was designed by well-known architect Thomas Turnbull as his own house. Over the years the house was divided into two flats and rented out, until 1961 when it was purchased by the Italian Government for its ambassador. Thomas Turnbull (1824–1907) was an important architect in mid to late 19th century New Zealand. You can read more about this Category 2 listed building on the Heritage New Zealand website (click the link above). The image below shows the house when it still belonged to Turnbull (he sold it in 1898) – this is a detail from the lithograph on the left. On Sunday 13 March 2016 over 40 members visited Crofton in Ngaio, and enjoyed a wonderful afternoon tea. Built in 1857, Crofton is of special significance as one of the oldest surviving houses in Wellington and is a relatively rare remaining example of a house dating from the 1850s in New Zealand. Four times Premier of New Zealand, Sir William Fox (1812?-1893) built the house as his Wellington country house early in his political career. It remained in his ownership when he became Premier in 1861. Crofton is an important link with Wellington’s colonial history and is a Category One historic place. In 1862 Crofton was bought by Bishop Charles Abraham (1814–1903), the first Bishop of Wellington, who opened the Church of England Grammar School in it in 1863. Also known as Crofton College, Kaiwarra, it educated many of the sons of leading Anglican families and was one of Wellington’s early secondary schools. When the school closed around 1875, Crofton became a residence once again. Dormer windows were added to the first floor, sometime after 1895. The decorative barge boards on the front gable are no longer there, and the shingled roof is now corrugated iron. In the 1920s, the property was converted into flats, but was restored to a single house in 1980. Crofton remains a private family residence. On 28 November 2015 members and guests visited three places in Island Bay. Beginning at the Home of Compassion, we saw the chapel, which was designed by Structon Group and built in 1990, with John Drawbridge designed windows and Stations of the Cross. We visited the Suzanne Aubert Visitor Centre which is an exhibition dedicated to telling the story of Suzanne Aubert and the Sisters of Compassion. Our next visit was to the Serbian Orthodox Church – built in 1906 and enlarged in 1922, it was first the Catholic Church in Island Bay before being sold to the Serbian Orthodox Church in 1968. Our third visit was to St Francis de Sales Catholic Church – the foundation stone for this church was blessed by Archbishop McKeefry on May 16 1965. The architect for the new church was Jason Smith from the firm of King and Dawson (Smith was also the architect who designed the recently classified Category One historic building of Freyberg swimming pool). Several people finished the tour with a coffee at the recently strengthened and refurbished Empire Cinema and Cafe. This first opened as a cinema in 1925. Other Island Bay historic buildings (not visited) include the Heritage New Zealand Category 1 listed former Erskine College, which has a beautiful neo-Gothic chapel – sadly ‘earthquake prone’ and not able to be visited. The Wellington City Council has also listed on its heritage schedule many of the Island Bay shops: “Island Bay Village Heritage Area, Shops and verandas 1905 – 1928”; a former Masonic Lodge at 221 Clyde Street; the Island Bay Band Rotunda (at Shorland Park); group of houses at 206-212 The Esplanade; and Erskine College Main Block and Chapel. The house was designed by architect William Gray Young in 1923 for the founder of the Plunket Society, Frederic Truby King (1838-1938). Truby and Isabella King lived in the house, with their daughter Mary, between 1924 and 1932. The house, located on the top of a hilly section at Mount Melrose, was constructed by Wilson and Johnson of Kilbirnie, in 1924. The design of the single storey timber building shows influences of the American bungalow and colonial styles. The house included a formal public wing for entertaining dignitaries to the west, and private living spaces to the east. The geographic positioning and spatial layout of the house maximised sun and light exposure to the northern elevation, illustrating King’s ideas about the importance of the environment on people’s lives.It is a Category 1 listed building on Heritage New Zealand’s Heritage List. Click to read more. On 4 September 2015 Adrian Humphris, archivist, gave HPW members and NZIA architects a fascinating account of how they went about researching architects who worked in the Wellington area from 1840-1940. 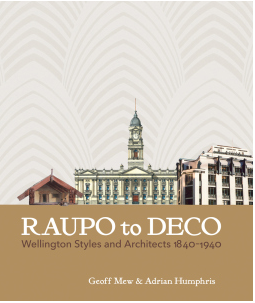 On behalf of his co-author Geoff Mew, for the book, ‘From Raupo to Deco’, Adrian used five architects to illustrate the convoluted discoveries and fascinating stories they encountered. They now have a rich data base of information which is searchable. Frank Starck followed with a background of his previous career as CEO of the Film Archive and discussed publishing in the modern world – books still have their value. * Hancock Shaker Village, Massachusetts, USA. These open-air museums are becoming increasingly popular and are a means of saving old and unusual buildings which may not otherwise be viable to keep. Tour of the Paekakariki area, Sunday 31 May 2015. 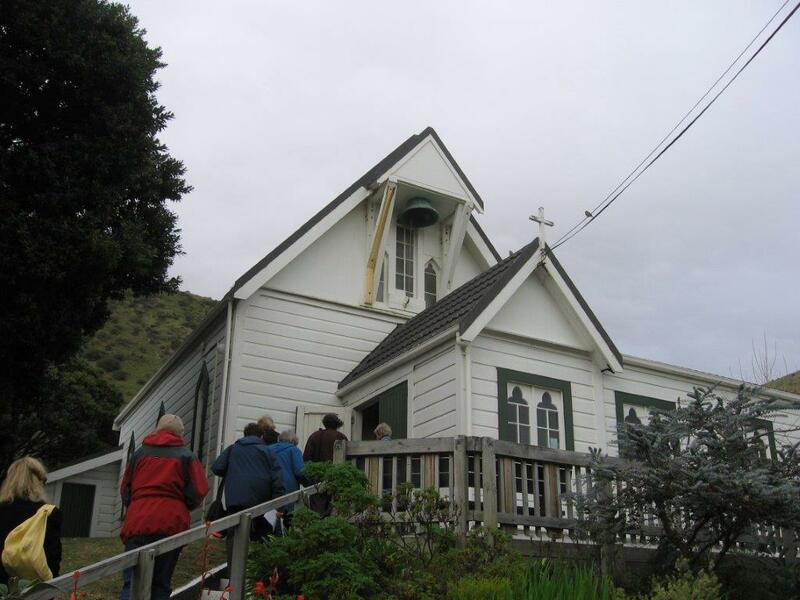 For our May event, we arranged a tour of the historic features of the southern Kapiti area centred around Paekakariki. We were fortunate in having as our guide Anthony Dreaver, well-known Kapiti historian. Memorial to drowned US navy personnel in Queen Elizabeth Park. Local John Porter remembers the US presence from his childhood. First State houses: Patrick Street, Petone walk, 8 March 2015. Historic Places Wellington, with support from Patrick Street Heritage Group and Petone Historical Society, hosted a walk in Petone to see the first state houses built in New Zealand. 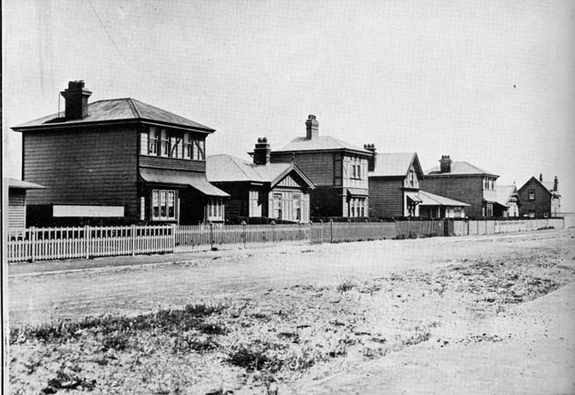 Prime Minister Richard Seddon’s Workers’ Dwellings Act in 1905 was followed by a competition for designs of high quality and artistic but low cost houses. Seven different designs were chosen from leading architects, and 33 houses were built in 1906 on the sand hills near Petone Beach. All except one are still standing and lived in. The Patrick Street Workers’ Dwellings Precinct, Petone, is listed as the Heretaunga Settlement Workers’ Dwellings Historic Area by Heritage New Zealand. The April/May newsletter of the Wellington Region Heritage Promotion Council also has information about our Petone walk. You can download a PDF copy here: WRHPC Heritage Today Apr-May 2015. See also our own May newsletter on the Newsletters page. For earlier events, see our newsletters.